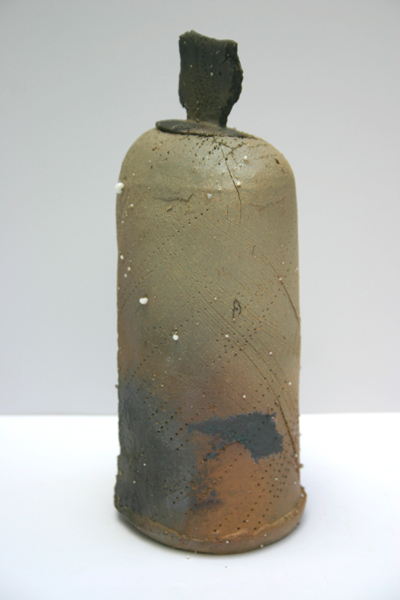 like this huge flask vessel from 2007. after my first experience of woodfiring with Nic Collins, and particularly of placing pots on their backs or sides on wads, that’s how I fired this one, in my gas kiln. it was too tall for the kiln standing up. I also placed some little containers of salt near it, something which I had seen Nic do. 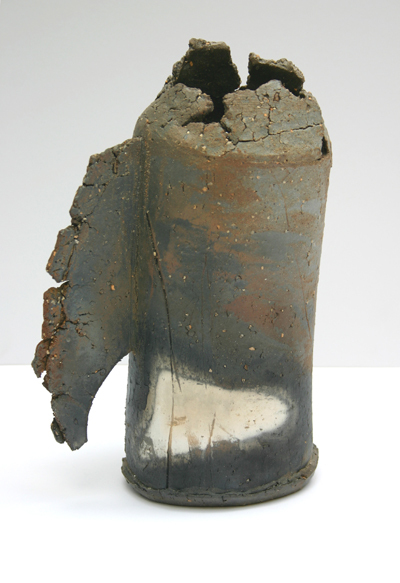 this was fired in a makeshift saggar also in my gas kiln, with hardwood shavings. I tried it three times and the best results came from this firing. 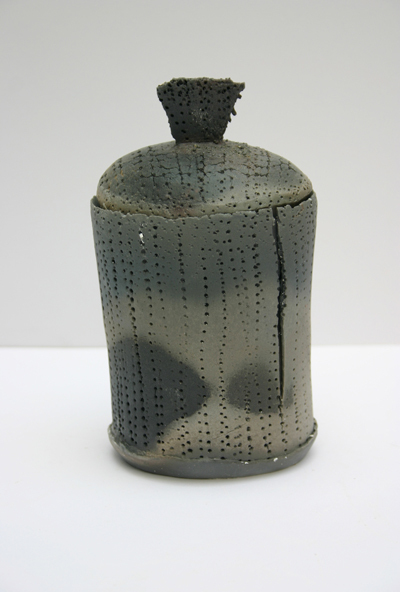 there are two other pieces, both of which reflect the changes in my work due to firing with Nic, and with Gas Kimishima, when I spent two weeks camping and firing for ten days in a wood near Tring. now I have got such good results on Nic’s woodfiring workshop, I will continue to take part – it is a unique opportunity for me to wood fire in a group situation, with all Nic’s expertise available, something I could never do at home. 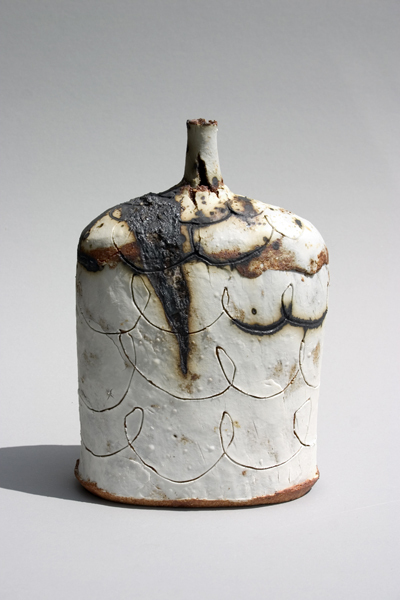 my pots really love this sort of firing. 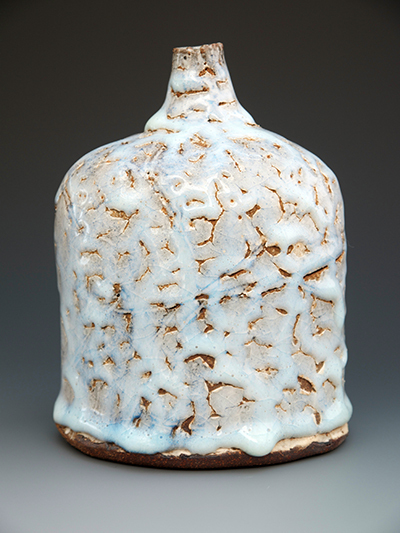 in contrast, there will be a big group of gas-fired pieces in this chun glaze with the crawling slip and iron oxide under it. 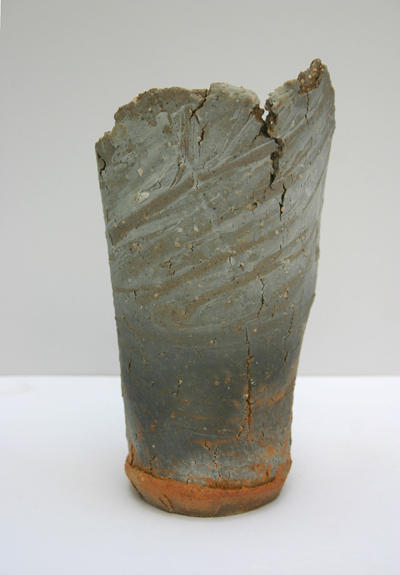 the jewel-like chun glaze rolling off and dribbling over the naked clay has the same kind of feel as the wood fired pieces, but the light colouring, refracting and reflecting light, makes them at the same time quite different. 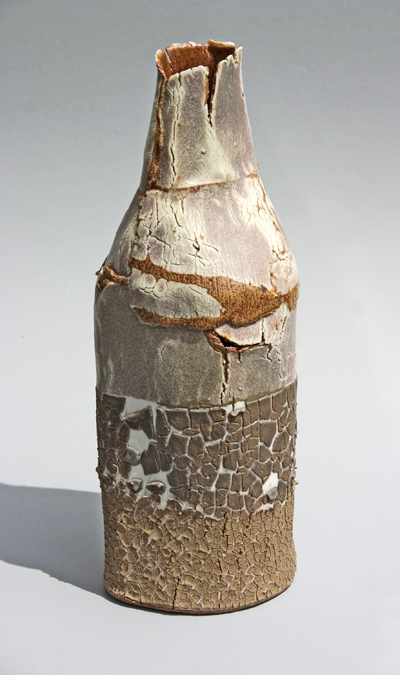 clay, pots, trees, ash, leaves, light, refracted blue ….. 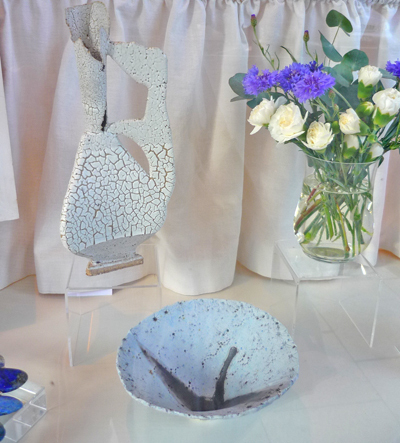 I hope to see a few people who like my pots, at the Bircham Gallery on Saturday 17th January! my exhibition at the Stour Gallery has been on for three weeks now, and I am only just getting around to posting about it. I probably needed a bit of distance before thinking about it again. I have only two photos from the gallery; it was evening and the lighting made it too difficult, so I can’t really give you a good idea of how it looks, but I am very pleased. the mixture of my pots, which seem very restrained with their rock/nature surfaces and colours, with brightly coloured late 20th C “Modern Master” original prints – Bruce McLean, Albert Irwin, Ceri Richards, Sandra Blow, Terry Frost et al – and a great Maurice Cockerill canvas with thick mauve paint pooled and almost spilling off – and Adrian Frost’s vibrant little abstract paintings, works extremely well, and even better, an arrangement of my pots including some of the grey-blue textured porcelains along a low shelf under a selection of delicate Peter Blake prints in similar blue greys and browns. 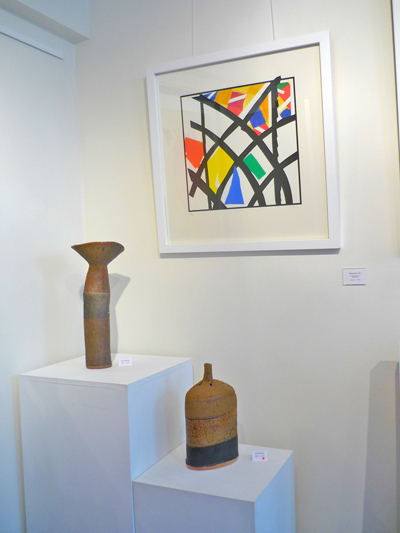 this saggar-fired bottle from last September looked particularly good under a big striking McLean print. 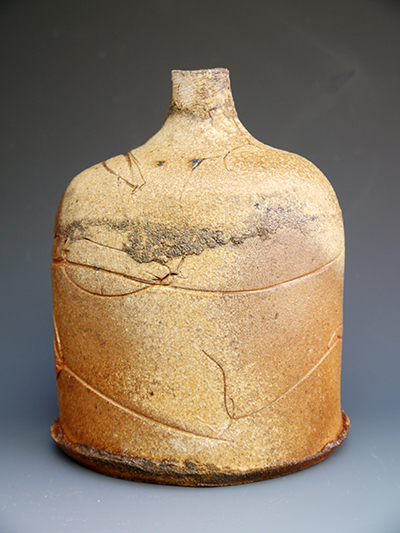 it was nice to see some more pieces fired in Gas Kimishima’s 2008 anagama out in the world too, like this quiet scored bottle. 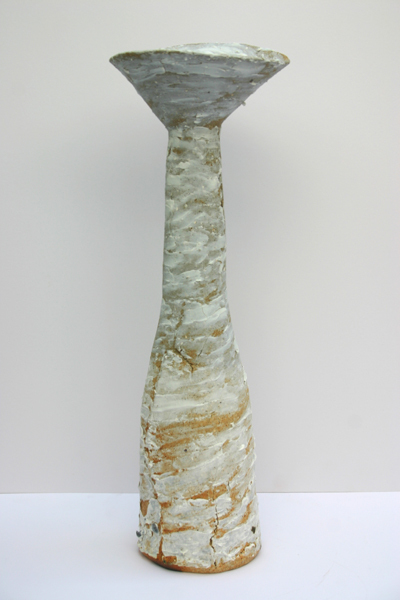 this new porcelain layered piece looked very striking too, some good lighting and the gallery white wall does help! 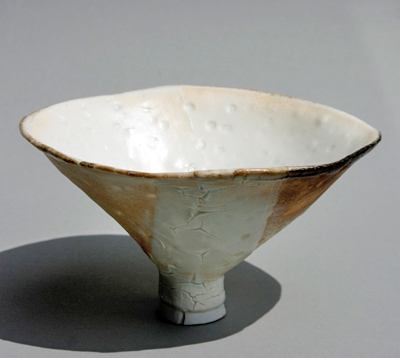 Sarah asked for a couple of these porcelain stem bowls – I will be interested to see if they sell. they are somewhat different from my usual rugged oeuvre. 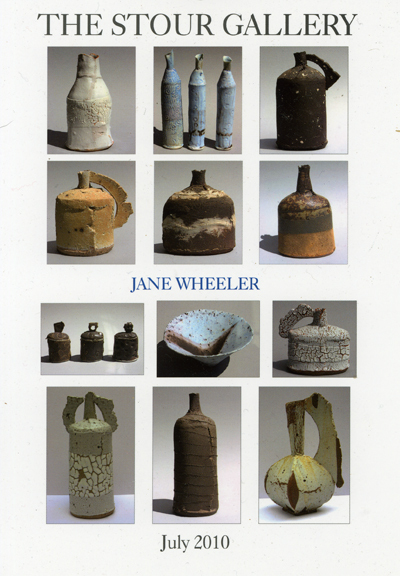 the exhibition is on for two months, finishing at the end of August, which I am also pleased about, especially as it’s the only exposure my pots are getting this year. my first glaze firing for almost four months. 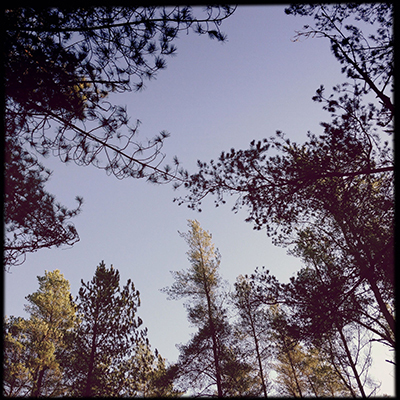 it is so much more pleasant in the summer. I got up before five to turn the burners up – 617 C in spite of one burner being out – the spiders again, I suppose. I relit it and it was a bit noisy but no more trouble. 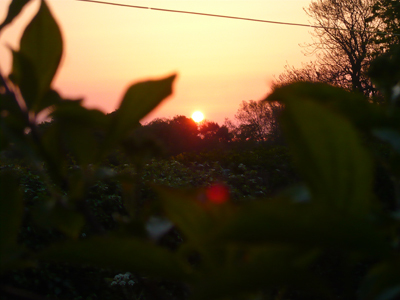 the sun was a big red disc at five, just up, but the camera read the red as white, not half as pretty. I have watched him singing more this spring – he fluffs up his feathers and points his beak to the sky, keeping a beady eye on rivals from side to side. 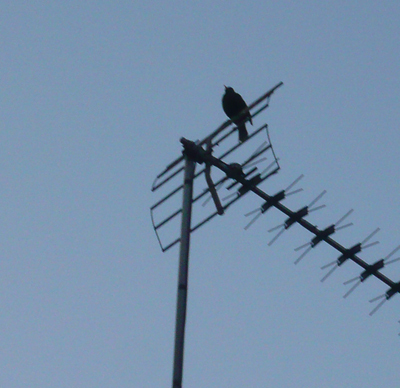 sometimes he utters a fluting phrase while skipping along the roof ridge, spreading his tail like a fan. 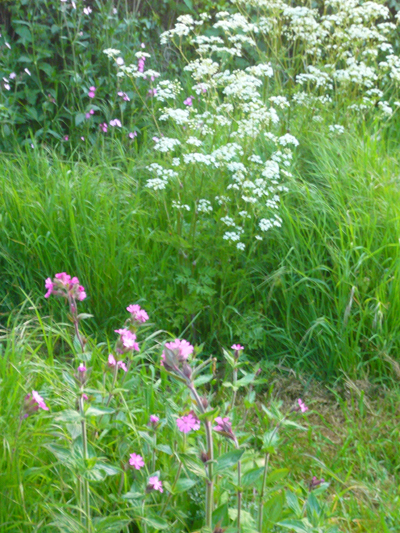 the wild garden is a joy – I walk up and down to check the kiln every half hour, taking in the cow parsley and the red campion. 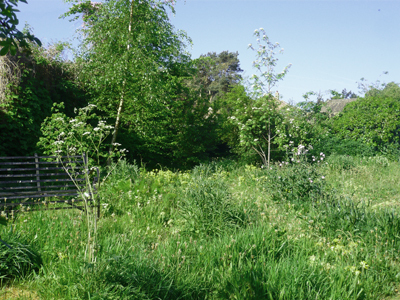 the trees are beginning to grow into a real but miniature copse in the corner, and the rowan is in full flower just now. 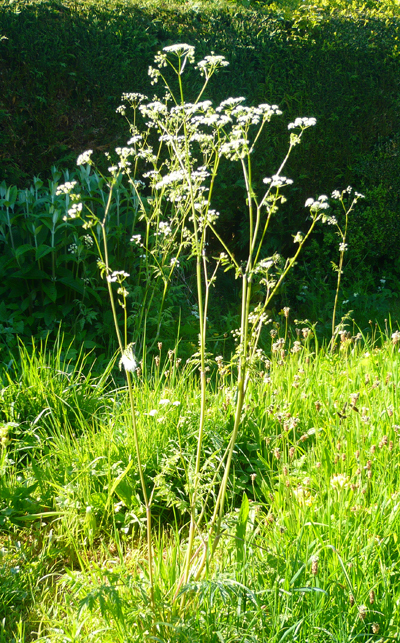 the early morning light picks out every delicate branching flower and stem and leaf. 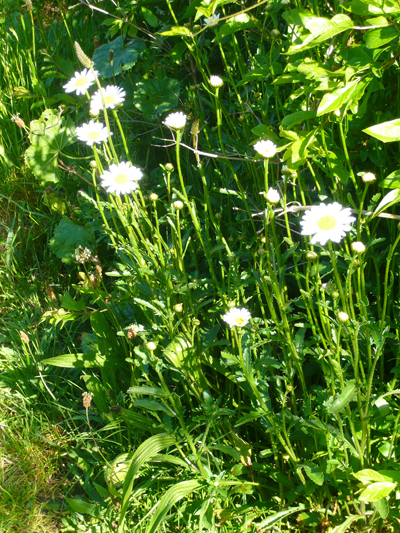 moon daisies, I call these, but they are really ox-eye daisies. after forty hours the kiln is cool enough to open. you can see I stopped the firing before cone eleven had done more than wilt slightly. the lower half of the firing was occupied by a saggar made of kiln shelves. I had trouble getting reduction after a thousand degrees – it didn’t start reducing properly until over eleven hundred. normally I like to get a heavy reduction between ten thirty and eleven thirty and then burn relatively clean , although still reducing. I think my flue is the problem here, it had started to come apart, so I couldn’t close it up as much as I should have. the saggar firing was a failure, I had filled all the gaps at the bottom and sides, and it seems to have prevented the heat getting in, so that the shavings hadn’t burnt away and the glaze on the pots is still powdery. they will all have to be re-fired I am afraid. this one didn’t have glaze on it, so I have to decide whether to leave it as it is or to glaze it and re-fire to stoneware temperature. the carbon will be interesting under a glaze. 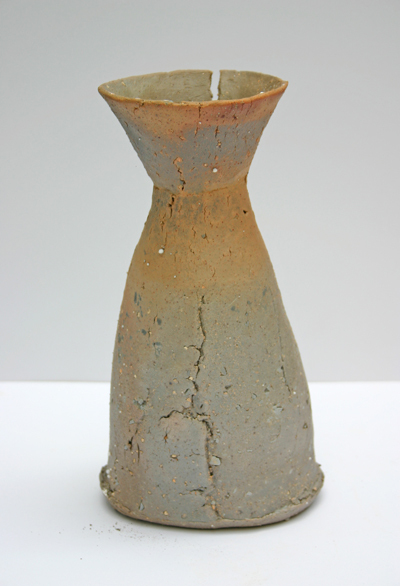 the pots which were in the top half are fine but I think you can see the effect of the late reduction. this shino traps carbon with a lovely lacey effect of grey in the white if it is reduced early. I have christened this rather pure and feminine looking jar Snow-white. 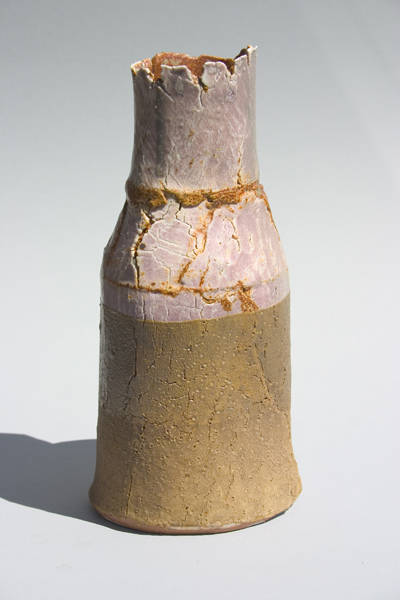 I have never got this copper/tin/dolomite matt and slightly crystalline glaze to change from green to pink before – it must be due to late reduction, and the porcelain layer. usually I get green with orange. 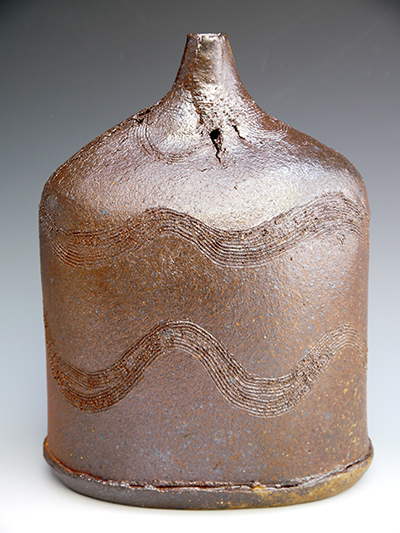 this one is more typical, and it was just in a different part of the kiln. 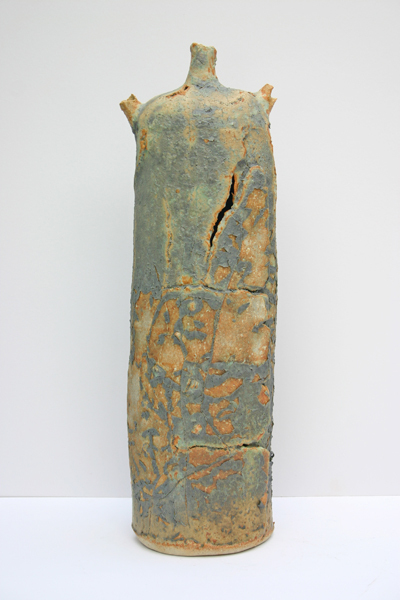 I have recently mixed up a new batch of the ash-clay glaze and it takes a long time to settle down and become truly thick and glutinous, giving an almost cracked-off crawled coating. here it is over the bright orange extremaduran terracotta which I brought back from Spain. 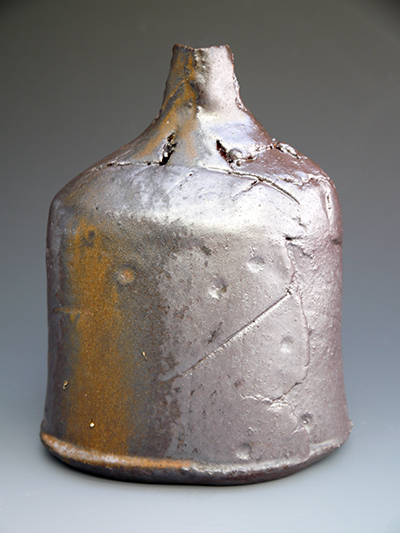 this one was on the hotter side of the kiln, and it is a different version of the copper/tin/dolomite glaze with less copper and a dose of cobalt in it. the cobalt shows more on the edges, as a greeny-blue tinge. 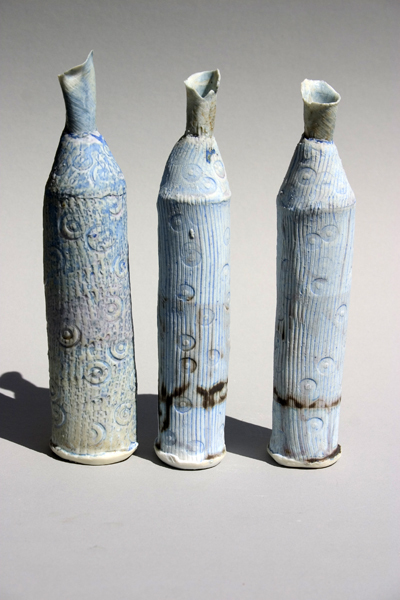 I refired these three porcelain bottles; they had the barium carbonate glaze on and were looking a bit boring, so they got a thin coating of the same glaze as above. the barium makes the blue much brighter. I think I will give them a coat of something else and re-fire again. 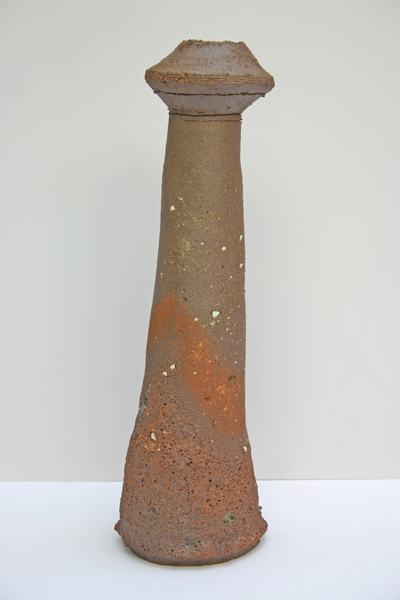 this is a new glaze, basically an iron rich temoku with its alumina content much reduced. I did not expect this metallic plum colour, but it is rather beautiful over the porcelain. 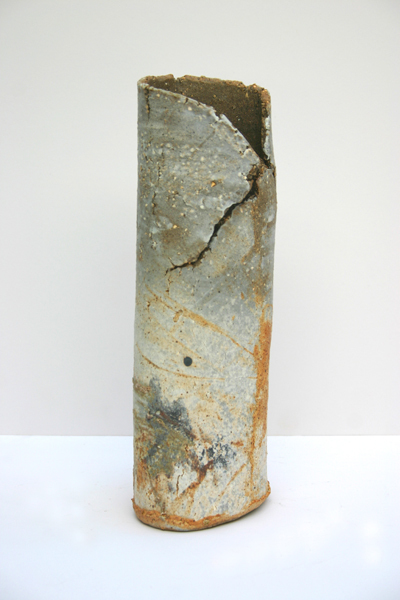 it came from some experiments in Ceramic Review showing how reducing the alumina content would produce a crystalline effect, a speckled mustard coloured matt glaze – my firings are a little high for this one really. 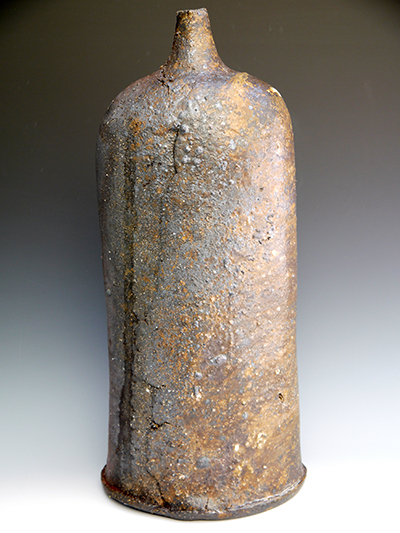 seems there was not much reduction going on here though – iron should turn green in a reduction firing. yesterday I opened the third go at this new world of saggar firing. it had been a slow firing, partly because I was trying to allow the heat to get into the saggar, and overnight I didn’t turn the pressure up as much or as quickly as usual. then it was even more difficult than usual to get a good steady balance of rising temperature combined with visible signs of reduction – sooting up of the cracks in the clay around the bricks at the front, and a flame from the flue exit. 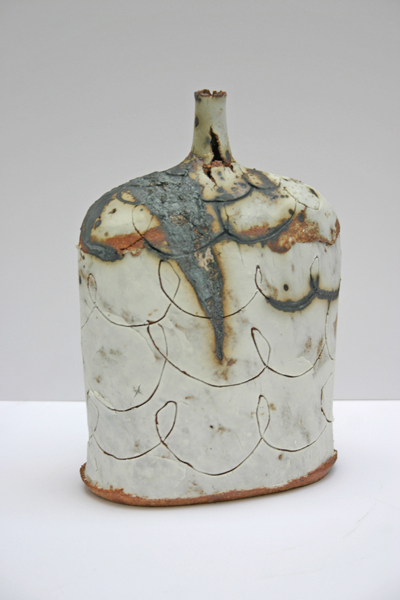 I had glazed all the pots in the front part with the same combination – the barium “chalk beach” glaze underneath and a layer of the copper/tin/dolomite glaze on top. 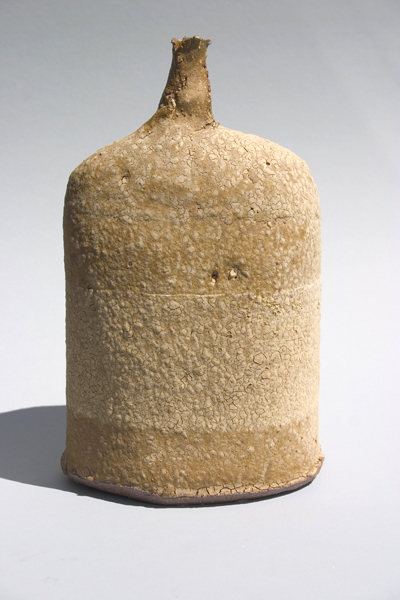 I tried this on a couple of pots and called it “saltings” in the first saggar firing. these were fired pretty hot, as they were in the middle of the top shelf, and came out as a pale version of the “saltmarsh” copper/tin/dolomite. 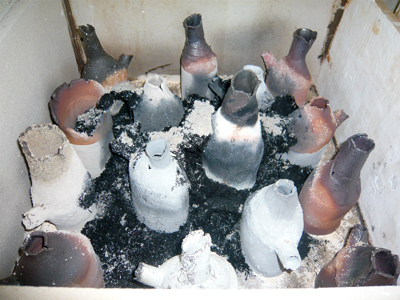 no such thing occurred on these six pots placed at the front of the kiln in this firing. 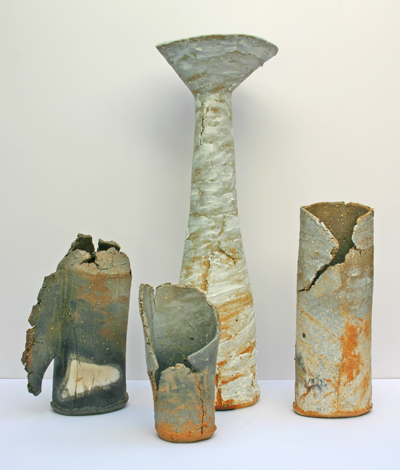 I am not sure if it is cooler temperature, thicker coat of the second glaze, or lack of reduction, perhaps a combination of all three, but they were all a soft metallic grey or greenish grey with orange breaking and copper green on the edge of the join with the barium. plus two had crawling and peeling off, which is actually rather pretty but very fragile. 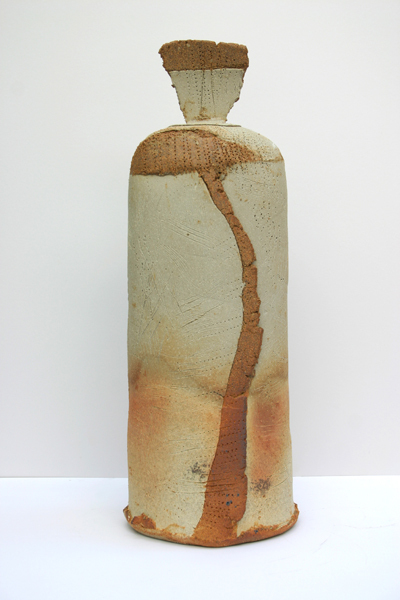 on this one it is a small area, and we are going to show it like this at the Bircham Gallery in October. on the other it was pretty well all over, so I took it all off, and I still like the result. 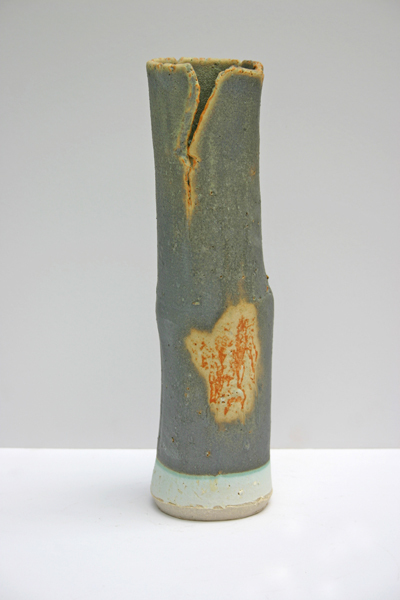 they both have scratched lines and little bumps under the glaze, which are more obvious where the glaze has come off. 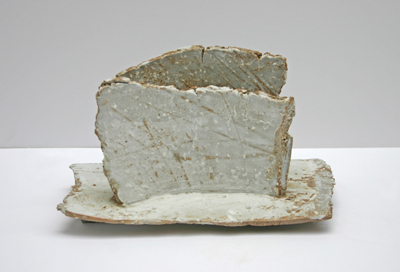 this is the white stoneware, and it is one of the pieces that went up to about three or four hundred C in the first attempt with the cardboard saggars. the orangey blob is where there was a carbon stain on the piece – a very fortuitous stain. as for the pieces which were inside the improvised saggar – in which the sawdust had burnt right away again; and this was no doubt due to air getting in low down, as Sebastian Blackie suggested it would be, since I used two big silicon carbide shelves which have slits in them – they were mixed, and there was very little black or grey, but I am still pleased with the result. 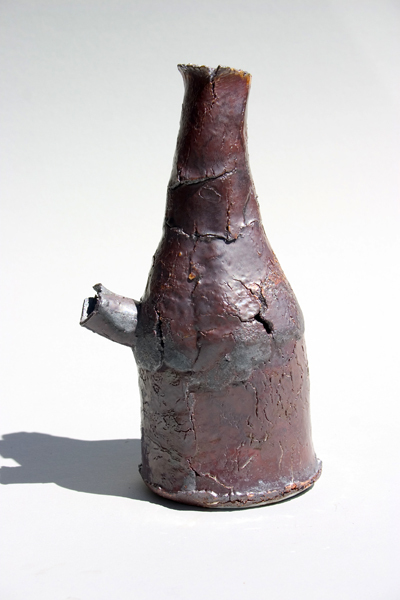 one thing I hadn’t expected, although I should have, I guess, was that the sheet of cardboard which had been left in had an effect on the firing, and strange brown ashy remnants of it were still there when I opened the saggar up. where it landed on pots it left a shiny glazed surface. first of all, I couldn’t be more pleased with this piece, the carbon marks and flashing work so well with the porcelain marks on the toasty st thomas clay. this little porcelain incense burner has been fired three times now, in my vain attempt to get it grey and black, but now it is really quite interesting, so I will probably leave it like this. it has a piece of cardboard glaze on its shoulder. but as far as I could see they are melted to about the same extent as the ones in the front. 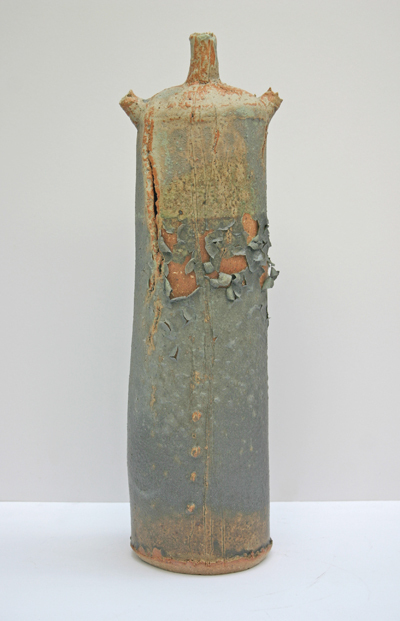 this has been affected much less by excessive heat than the similar but bigger piece in the previous firing, but the stains and flashes are more overt. I am giving this a rest for the time being as� the Beaux Arts exhibition in Bath is going to take up most of the coming week, but I shall buy some low firing ball clay to make the right sort of slip and have another crack at cardboard saggars as soon as I get some time, thanks to Sebastian Blackie’s kind advice and encouragement. the rest of the pictures of this firing are here. 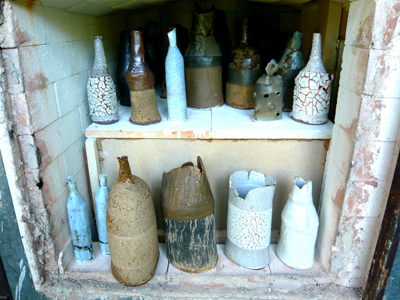 saturday’s firing was very very hot indeed. when I turned it off, I knew the temp was well over cone eleven; the light from the burner ports was much whiter than usual. 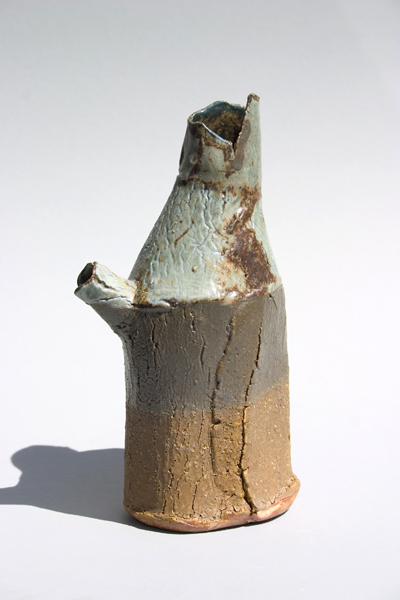 the problem with saggar firing is that you can’t see any cones which are inside the saggar. the ones on the outside had in fact disappeared from view – they had fallen off their perch, but you can see that they give a very inaccurate idea of what was going on as ten and eleven are hardly affected. inside the saggar though, cone eleven is well melted, never mind over. 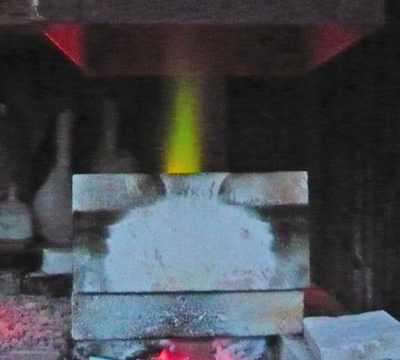 I photographed the beautiful green flame shooting up from the flue at the end of the firing. this was from the copper carbonate I sprinkled around the sawdust. the pyrometer registered 1277 centigrade before I turned� the burners off. that is the lower end of what you expect for cone eleven, but it’s almost the highest I have fired the kiln to, on one other occasion it got to 1280 before cone eleven went over – with the cones visible. usually it goes to between 1250 and 1265 before cone eleven is bending enough for me to finish the firing. the cone works on a combination of time and heat – the longer it takes to get to temperature, the lower the actual temperature that the cone will bend at. however, without establishing some records, and trying out the parameters, I won’t know what goes on inside a saggar. so to take the kiln up to this white heat taught me some vital clues. everything survived okay, except the tall vessel in the rear left hand corner had started to bubble and melt, as it is made of the orange terracotta I was given by the Tinajeria in Extremadura. there is none of the black and grey carbon marking I expected, and I don’t know if it burnt off because of the high temperature, or the fact that the saggar was open at the top – and the top sections of the box, which were lightweight ceramic insulation board – had leant outwards, making it even less enclosed, which may mean that it failed to hold in the effects of the sawdust. there was a good deal of mess from the copper carbonate and from the steel wool I put in, and the only trace of the sawdust is some bits of green ash glaze caught around the feet of some of the pots. (this is an old kiln shelf on the floor, one side is already pretty much ruined). 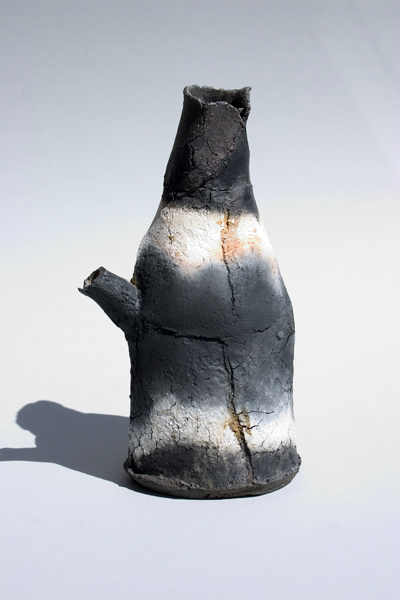 this bottle at the front with the black markings had a big clump of steel wool settle on it – quite a dramatic effect. 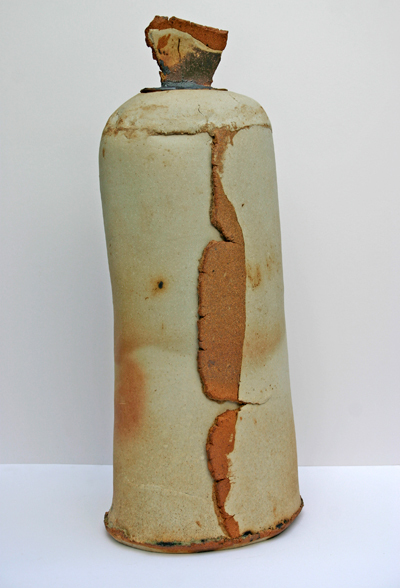 this big layered clay jar, whose siblings have all been glazed with the green and orange version of the saltmarsh glaze, (copper/tin/dolomite) has worked very well; the white stoneware has picked up some very subtle flashing and sawdust markings, the extra heat has just softened the form a little and the crank of the underlayer is a gorgeous toasty rust. 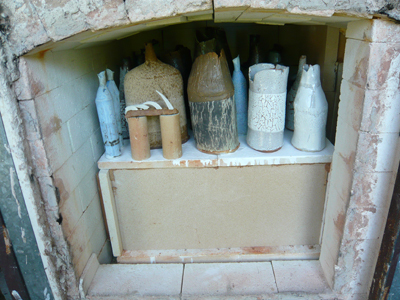 which will be the back half of the kiln in a vertical slice. I am just a little nervous about keeping these big shelves upright during the firing, but the slight weight of the lid, made of ceramic insulation board, plus tall props wedged behind them, and a shelf against the front one should keep them in place, and I plan to have cones inside, and ones outside which will stay in place, as the front of the kiln will hold a normal glaze firing. a piece of card to keep the sawdust in place until I can shut it off with the final kiln shelf. you can see the rest of the pots here. after all the talk about packing and building saggars, here are some of the results of the first firing. 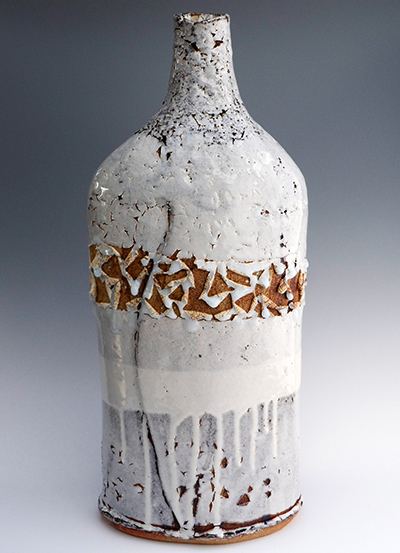 the clay body becomes even more important when the firing does not involve glaze, and some of the things I do with porcelain overlay or inlay can really show to their best advantage. 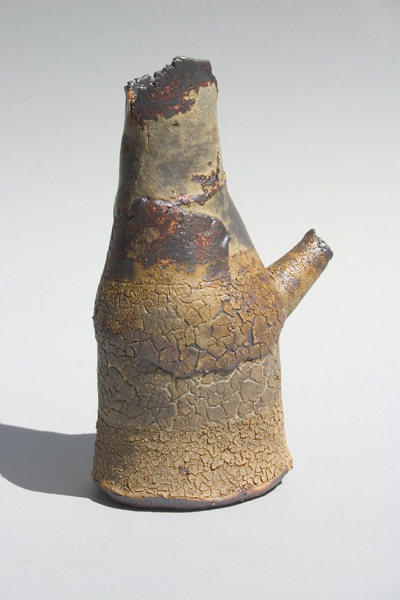 for instance, recently I have been smearing runny porcelain onto pots with my fingers and scraping parts of it off again, in sort of reverse finger painting, using my nails to draw into the surface, or building it up to a rough thickness. these marks need the right finishing process to make the best of them, and I think I have found it. 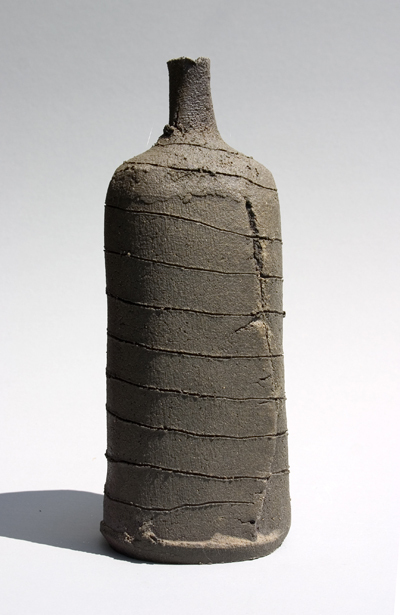 the body of this piece is reduction St Thomas (an old fashioned clay that we used at college in the sixties) opened up with very coarse grog, and in some of the pieces, with the sand and grit from my olive grove in Extremadura. the red flashing and black carbon markings work with the physical mark-making through the porcelain on the surface, which shows up well as the colours have been warmed up by the atmosphere in the saggar, and I am very pleased with the result. 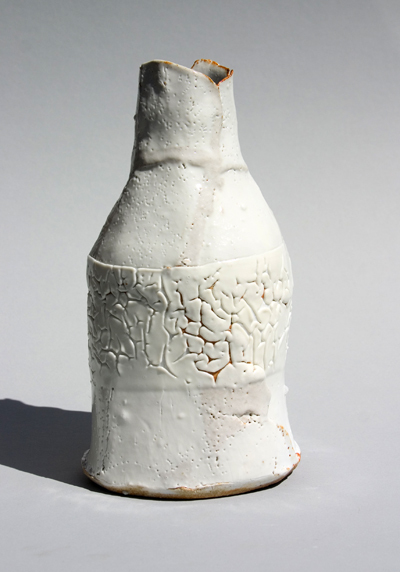 this one is the same clay with finger-painted porcelain and it is different again. the consistency of the sawdust must have made the difference – I had a mixture of very fine, real dust, and coarser stuff almost like shavings. also where it was placed in the saggar will have had an influence on the markings. I placed this one upside down. 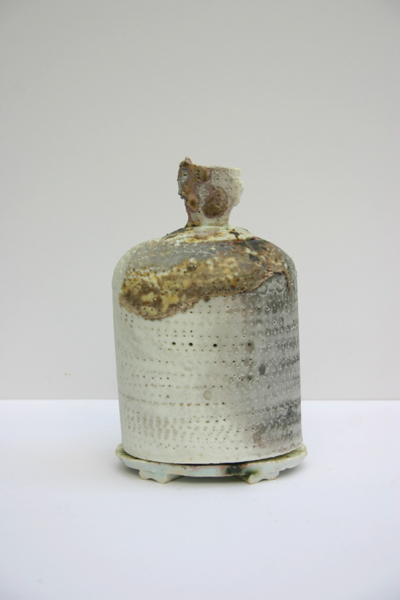 the lovely warm coloured flashing around the top is in contrast to some of the other pieces which are very dark – typically porcelain tends to turn grey or black in this firing. it has porcelain inlay which has turned grey, and you can’t see in the photograph but the lower paler parts have a slight metallic lustre. this is a good example of the range of shades that carbon will produce on porcelain. very exciting, I think. another porcelain piece with great markings. 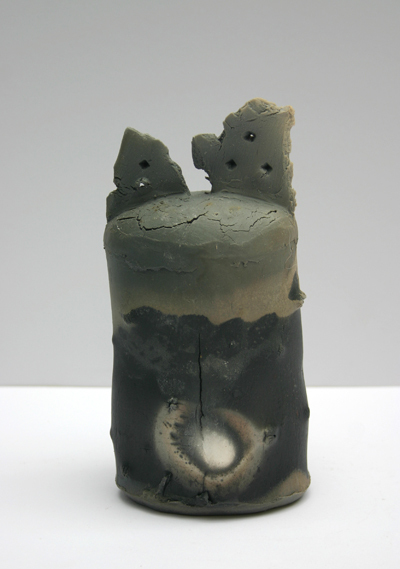 the barium glaze works well on porcelain too, but I have this little incense burner back in the kiln at the moment for a re-fire in the saggar, to see how that goes, as I have two similar pale pieces and I like the idea of a black/grey incense burner. I may well re-fire this one, as the porcelain finger painting over the st thomas clay is so much more exciting in the saggar part of the firing. 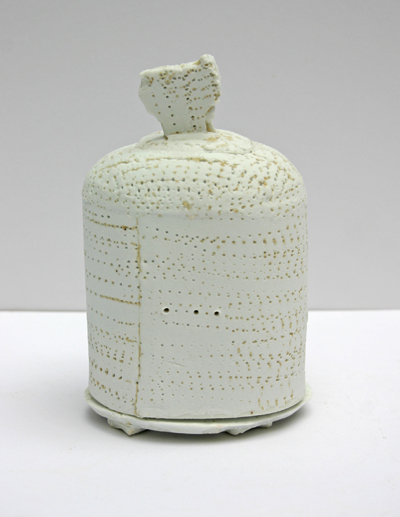 also working well is the very white stoneware which had the extremadura treatment. 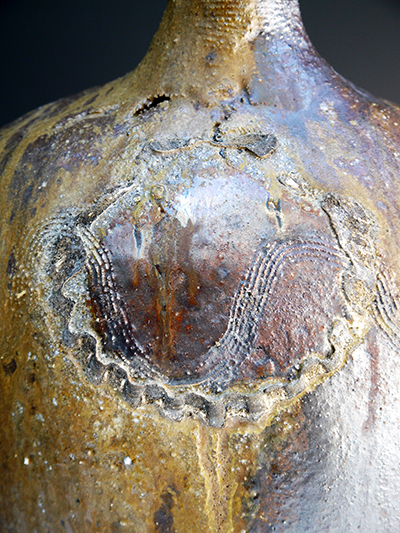 you can see the little white blobs of feldspar which have emerged as they melted during the firing, contrasting with the carbon marking and warm flashing from the sawdust. 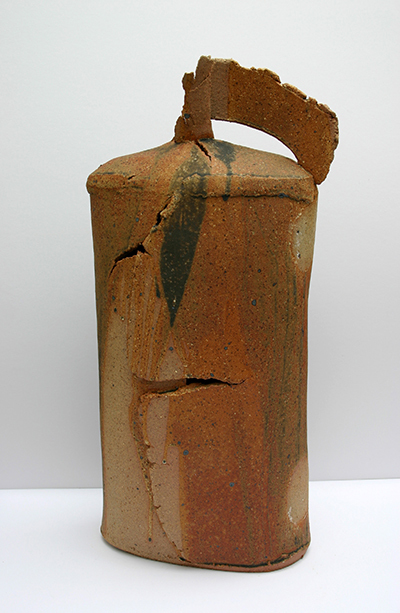 the lid was fired on the floor under the sawdust, which accounts for its very dark colour.